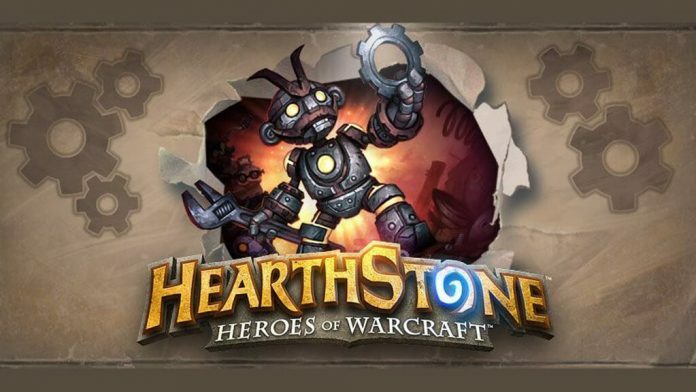 The newest Hearthstone patch 10.2 for the Year of the Mammoth is out. It offers many changes to popular cards as well as a change to the overall ranking system that has been in play as of early in the game’s life. Below are changes, as well as some of the impact that it will mean for players. Corridor Creeper now has 2 attacks instead of 5. This is a popular card as it costs gets lower as things die, making it fairly easy to play a 5/5 for 0 cost. Its attack is down by 3 points. It will probably leave many decks lists, but overall it is still a pretty decent card. This is one that will probably remove it from many decks as well. Having that first turn pop, or combined with a few other things in many rouge decks, a first turn hit for 5 was pretty good. I expect that poor patches will be rather neglected now. Bonemare cost increased by 1 to 8. 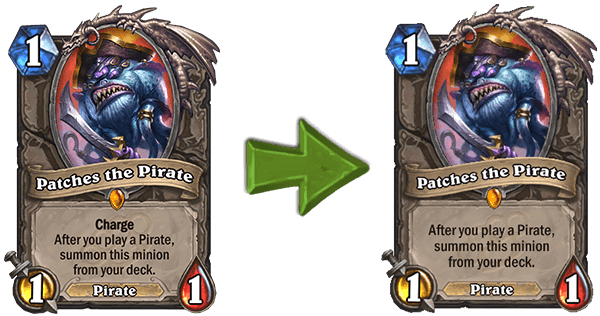 This is not too big a change, this is a fairly powerful card, and this cost change will probably not change it inclusion in decks that already have it. 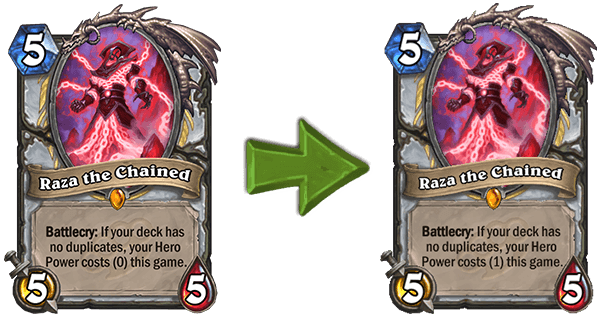 Raza the Chained reduces your Hero Power cost to 1 instead of 0. This will have some impact on the decks designed around them. Mostly the priest decks that build a win condition of being able to use their hero power to do damage an infinite amount of times. This will limit them to using it far, far less, and will probably see this type of deck all but vanish in its current form. Overall, these seem like decent updates to the cards. Though I feel it makes patches a nearly different card. It will probably end the popularity of a type of priest deck. I am sure the inventive Hearthstone players will find a use for the cards as changed. Starting on the first of March, a ranked play is going to change. Mostly this will affect the end of the month change over, but it does offer some changes overall. The first big change is at the end of the month. Rather than reset your rank, and then get bonus stars based on your rank, you will simply drop 4 rank levels. What this does is a start to group players. I am a rank 10 to 15 player normally. At the end of every month, that’s about my highest ranking. When I start next month, I will pretty much start playing other players of my rank right off the bat. I will not play any rank 3 or 1 players battling back up the ranks. This will allow high ranked players more competitive challenges right off the bat. And yet saves some of the lower ranked players from having to be matched with players who are currently above their skill level. Additionally, all ranks will have 5 stars, rather than starting at 3 stars and gradually increasing. Because of the change, the way you earn the card back for each season has changed as well. Rather than reach rank 20, a player is required to get 5 wins. This is a minor change that only affects higher ranked players for the most part. Many of them started above rank 20. Now, while many players will still start above rank 20, they will need to play and win against other players of their level to gain the back. I’m in favor of these changes. It will let players play at their level from the start of the month and standardizes many things within the ranking system. You know how many starts you need to get to each level without having to memorize or look up the values. Or when you start playing on the first or second of the month when you have much less of a chance to have to play against 1 or 2 ranked players batting up to their proper ranks. It also allows extreme beginners a better field to play others and win the card back for the month. Wildfest is starting February 19th and ending on March 11th. There are many events pushing the “wild” format decks. The wild format allows cards from any set, past or present rather than just the last few released sets in the “standard” card format. 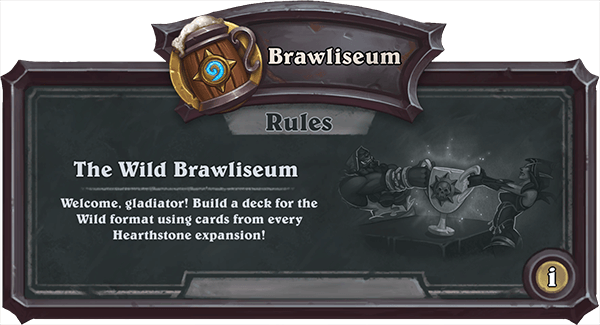 Some of the highlights include a Tavern Brawl mode with pre-built decks. All using wild format cards called “Venture into the wild” and “The wild Brawliseum”. This will be a mode like an Arena run. But you will build a set deck using Wild format cards, and try and win 12 times. If you lose three times, you are out. You cannot change the deck one built. The first try will be free, and additional tries will be the same as an arena run. Either $1.99 or 125 in-game gold. To celebrate this whole update, the store is also offering the “Year of the Mammoth Bundle”. 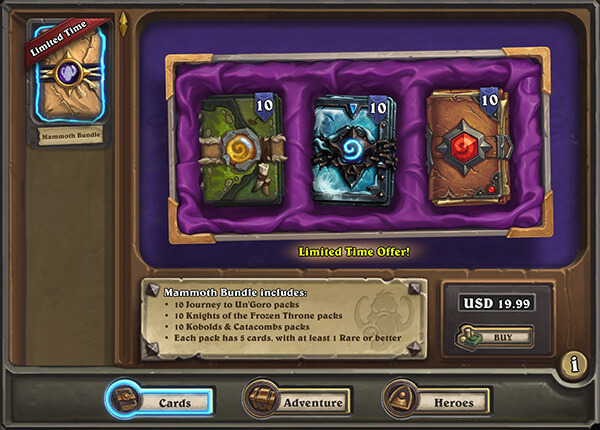 It is 10 packs of each of the 3 sets of Journey to Un’goro, Knights of the Frozen Throne, and Kobolds & Catacombs for $19.99. 30 packs for about $20. Not a bad deal at all. Unfortunately, it does not have an in-game gold price equivalent. It is cash only. 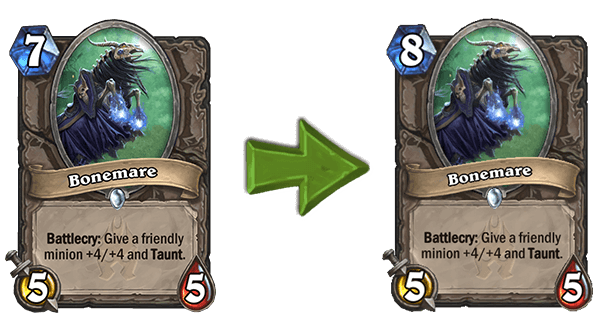 Changes to cards will change some deck types drastically. At the end, not a bad update for Hearthstone players at all. A decent place to start playing with as little money down as possible with 30 for twenty dollars deal. If you’re a Blizzard’s games fan, you should definitely check out the latest Destiny 2 update.